Left, a fly agaric mushroom in the early "button" stage emerges from its cup-like base under pine trees at the Bowman Street Conservation Area. Right, a mature fly agaric mushroom on the grass in front of Gibbons School looks like a classic toadstool, complete with warts and "skirt" beneath the cap. As the last wildflowers fade, fall brings us an abundance of wild mushrooms, including the colorful and poisonous fly agaric. With its shiny yellow cap covered with white warts, fly agaric (Amanita muscaria) looks like a classic toadstool--an inedible or poisonous fungus. That's exactly what it is. Many of them have sprung up in Westborough in the past few weeks, although the season for fly agaric starts in late spring and ends in late fall. You may have noticed one or several of these eye-catching mushrooms in open woods or even on grassy lawns around town. They sometimes come up in a circle known as a fairy ring. They grow in this pattern because most of the fungus lives underground and grows outward in a circle. The parts we know as mushrooms or toadstools are the fruiting bodies that emerge at the far edges of the underground fungus. The mushrooms release spores from their gills. The name fly agaric (or fly amanita) comes from the mushroom's use in the past as a fly poison. Pieces of the cap would be mixed with milk and left out in a dish to attract flies. The mushroom's poisons would disorient the flies and make them slow and easy to swat. If you wonder why a mushroom would contain poisons, especially ones that affect flies, take a careful look at the various mushrooms that you find in the woods. As they mature, many of them quickly become infested with insects, or with worm-like insect larvae that eat their way through the mushroom. A mushroom's poisons probably protect it from some of the insect predators that would devour it. If the poisons also keep humans and other large creatures away, that may be an added bonus. Fly agaric is just one of the many kinds of mushrooms in a sizeable group known as amanitas, sometimes also called death caps. Many are poisonous, some even deadly. This group is responsible for 90 percent of fatal mushroom poisonings. Amanitas often have a cup-like base, as in the photo on the left, which shows a young fly agaric in the "button" stage. Mature amanitas also frequently have a ring at the top of the stalk that hangs down like a "skirt" underneath the cap, as in the photo on the right. 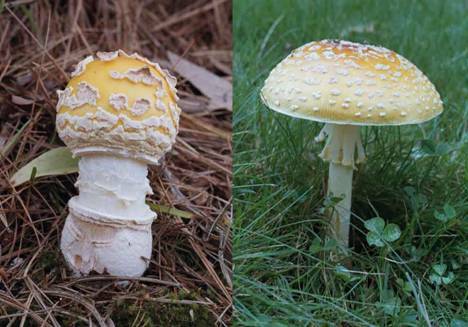 These traits can help you recognize amanitas, but they are not foolproof. What good are mushrooms? We often think of them as creepy things living off dead or decaying matter. But as they help to break down dead matter, they contribute to the general recycling that goes on in nature. They also provide another, less recognized benefit. Many fungi, including fly agaric, grow in a beneficial association with tree roots. This association is actually good for both the trees and the fungus. How does it work? The fungus helps the tree absorb water and minerals from the soil. The tree, in turn, provides the fungus with sugars from photosynthesis. About 90 percent of the different types of green plants in nature have this kind of beneficial association with a fungus. Without it, most plants would not grow as well as they do. Many people would add a third benefit: mushrooms can be good to eat. This is true of cultivated store-bought mushrooms and of certain wild mushrooms, but collecting wild mushrooms to eat is a tricky business. It's best left to those with the expertise and experience to identify mushrooms with complete certainty. Individual mushrooms can vary considerably in appearance. Different kinds can be difficult to tell apart and easy to confuse. The toxicity of poison mushrooms also varies. Fly agaric has different forms in other sections of the country. The fly agaric that we see in the east has a yellow or orange cap with white warts. A white form can appear in all parts of the country. In the midwest, the orange form is common. And in the west and south, fly agaric has a bright red cap, also with white warts. Related red forms also grow in northern Europe and Siberia, where they are surrounded by legend and folklore.